Akluj fort is situated on the banks of the Nira River in Akluj town. Under the guidance of ShivShahir Babasaheb Purandare, architect Mr. Dinakarrao Thopte and Avinash Thopte have created a Shivsrushti inside the fort. The Mohit Patil family has made special efforts for the restoration of the fort and the Shivsrushti. Buy a ticket and enter the fort where you will be welcomed by Elephants and Horse mounted soldiers made of hard synthetic fibre. There are also statues of many musical instruments here. Walking to the left on the fort wall we come across murals depicting the life of Shivaji Maharaj. The first three murals are related to Shivaji Maharaj's birth. Next there is a replica of the mansion which was the birth place on Shivneri fort. The naming ceremony has been depicted here. Other events are also explained as we move ahead. To the end the crowning ceremony has been displayed in a beautiful manner and all the murals displayed here carry detailed amd accurate craftsmanship. The bastion named Upalya which is in the middle of the fort has a statue of Shivaji Maharaj on it. This bastion must have been used for monitoring purpose. The surrounding area of the fort can be viewed from here. Murals of the Maratha soldiers belonging to various sects and religion are erected on the fort wall. They include Tofchi, Mashaalji, Tirandaaj, Paharekari, Ramoshi etc. proceed ahead along the fort wall towards the entrance where there is a museum. Here an elephant and his rider have been erected in a statue. In this museum many fort models have been made out of synthetic fiber, they are Rajgad, Raigad, Vijaydurg, Sidhudurg, Pratapgad, Devgiri forts. The fort is maintained in a good condition with plenty of greenery, flowers and fountains. Outside the fort when we move on the path alongside the river bank and the bastion we come across Veerghals and other ancient remains. Akluj town in Solapur district is well connected with major cities by road. 1)	Pune to Akluj is 166 kms. 2)	There is a diversion for Akluj at Indapur which is on the Pune � Solapur highway. 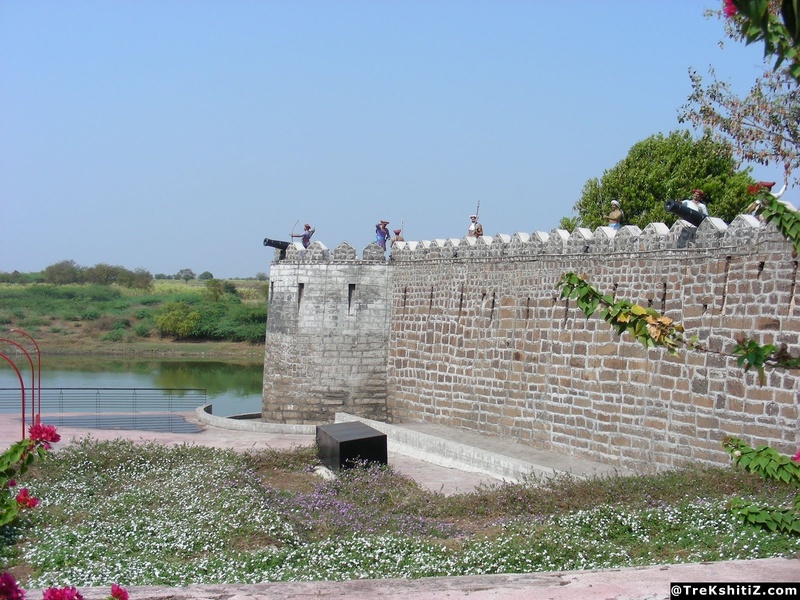 3)	Akluj is 35 kms from Solapur on Solapur � Pandharpur highway. Entrance to the fort is paid. The ticket prices are Rs.20/- for adults and Rs.15/- for children below 12 years. Fort visit timings are 10 am to 1.30 pm and 2.30 pm to 6.30 pm. There is a light and sound show inside the fort in the evening hours but for that a minimum of 25 audience count is necessary.